How much do you carry around in your purse on a daily basis? I’m not even going to admit to all the stuff I carry around, but I know this: Since I started carrying my laptop or tablet to meetings, I seem to have outgrown my very stylish and fashionable handbags. So I set off on a search of the perfect new bag. There are a couple of features I look for in a laptop or tablet bag. Not only does it have to securely hold my electronic devices, it has to hold everything else I lug around in my handbag or purse. That may not seem like a lot to ask for, but I’m an organized person. I like to know which pocket my phone is stashed in; I don’t want to have to search my whole bag looking for it. I also need slots for my lip balm and cosmetics and a place to put my car keys so they won’t scratch my phone screen. The right bag has to have a comfortable shoulder strap, one that won’t constantly slip off, and it even needs an outside pocket for my always-present water bottle. And, of course, it has to look fabulous and match my style — because after all, I’m carrying this bag around with me all day. Here are four bags that come very close to passing my must-have list of criteria. See which one fits your personal style. I’m partial to a tote-style bag, which is why Ogio’s Hampton Tote bag caught my eye. First, it comes in great bold colors like red, yellow, green and a beautiful blue. It’s an attractive bag with stylish buttons on the outside and a decorative (removable) belt that ties in a bow across the front. The material feels soft and pliable. On the inside, there’s a fully padded, fleece-lined compartment that holds up to a 15-inch laptop with an elastic closure. The other side is perfect for magazines, file folders or a book. There’s also a zippered compartment for tucking away valuables. On the outside, there are three side flap pockets; sadly, not one of them is deep enough to hold my water bottle. They’re made for keys or small charging cables, but I would have liked to have stashed my water there for easy access. I did find a water bottle slot in a corner of the inside of the bag, but I don’t love the idea of carrying water near my electronic devices. On the back of the bag is an organizer flap that zips open with enough room for almost the entire contents of my purse. There are slots for pens and lipsticks and a mesh enclosure for keys and zippers galore. The straps fit comfortably on my shoulder without seeming to add too much weight. Since I often take the very crowded NYC subway, I appreciate that Ogio thought to put in a zipper on the top of the bag. 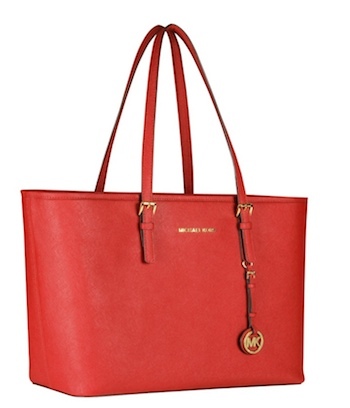 If you prefer a more upscale, sophisticated look, the Michael Kors Tote is for you. It’s made of soft leather with shoulder straps that feel luxurious to touch. The sleek, minimal exterior comes in a variety of stylish colors (but alas, no purple). The inside of the bag is comprised of three compartments. A zippered inner pocket safely stows your laptop. Attached to that is a smaller pocket for your tablet. There’s plenty of room for books, a wallet and cosmetics but no separate compartment to keep them all organized. 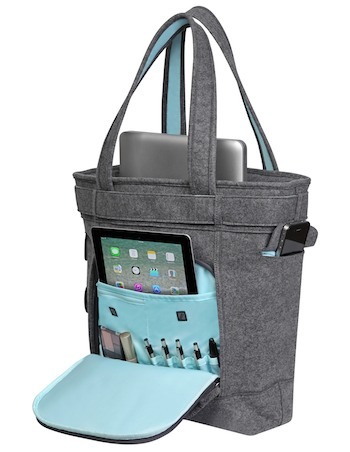 A small pocket holds your iPhone so you don’t have to go digging for it, and there's a small zippered compartment on the opposite side of the bag. I would have preferred more room for organizing my everyday items, and I also like having room to throw in lunch or a snack if I’m headed to work. There’s no water bottle holder, but I probably would be nervous about spilling water all over that beautiful leather anyway. I’ve used and enjoyed Jill-e handbags in the past, finding them to be attractive and well-made, so I’m intrigued by this new line of backpacks for women. 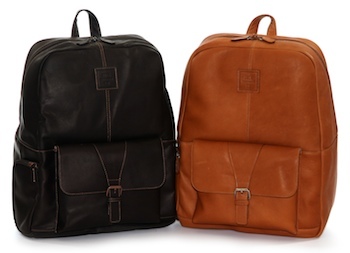 The Hemingway backpack is made of soft leather and comes in tan or dark brown. Inside there’s a padded pocket that holds up to a 15-inch laptop. There are also two pockets on the inside for your phone, charging cable or any of that other stuff you carry around. Your wallet can be tucked safely away in the zippered compartment. It’s not organized, but it’s quite roomy. The entire bag zips closed on the top with a pull tab on either side. On the outside, there’s a front flap secured with a snap with plenty of room for a smartphone, keys and other items you want easy access to. The adjustable straps are wide and padded and sat comfortably on my back. A leather handle on the top of the bag helped me put on the backpack and makes a convenient way to carry the bag without wearing it. And here's a nice bonus you’re traveling: a trolley sleeve on the back that lets you sit the backpack on top of a rolling bag. The back of the bag is made of nylon, not leather. Jill-e says this is done to keep the weight at 2 pounds, but I prefer the soft feel of the leather, especially for $199. One thing they definitely got right — there’s a zippered side pocket that has enough room to hold my water bottle. Jill-e also makes a lighter, less expensive version of this bag in nylon for $99. There are some days when all I need is my iPad, iPhone and some essentials. 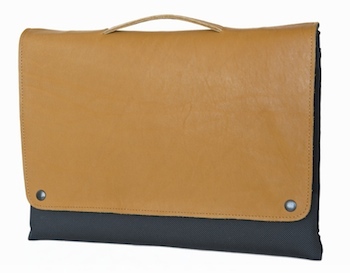 For those days, there’s the Waterfield Designs City Slicker iPad sleeve. It’s literally a sleeve you can carry around like a clutch purse, with the options of adding (at an extra cost) either a handle or an adjustable shoulder strap — or both, if you like options. Inside you'll find a soft, furry lining in which to nestle your tablet, then a layer of neoprene and then plastic and ballistic nylon on the outside. 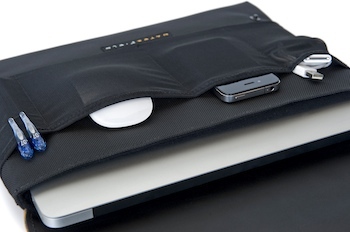 The company says this triple layer is designed to protect your devices. I just think it feels like a warm, comfy sweater in there. What I love is that the pockets on the outside don’t detract from the sleek, thin look of the bag (see image at the top of this post.) There’s a stretchy mesh pocket running the width of the back with a soft lining and a zipper enclosure. On the front are three mesh pocket slots wide enough to stash your phone or perhaps a Mi-Fi device. The front flap is secured with two snaps that are strong enough to keep it closed but won’t break your nails when you're trying to open them. You can order the sleeve in one solid color, but I love the look of the contrasting color on the outside flap. It comes in distressed, naturally-tanned black, chocolate, grizzly, nubock or Peruvian leather. For those days when I’m making a quick trip into the city and can live without my water bottle, the City Slicker gets the job done in style. What features do you look for when choosing a bag? I carry a bigger Vera Bradley bag, and I use smaller cosmetic-size bags for the smaller items I need: cords, mouse, thumb drive; separate one for personal items; another one for paper clips, pens, etc. And I agree with you, an outside water bottle holder is a must! I am not going to fancy meetings, so I am not so worried about image as having all of my gadgets when I want and need them. I only have a 7” tablet also. I got a soft sided fishing tackle box. It is a pretty blue bag with lots of pockets and a hard sided clear case that fits inside. I put my earphones, pens, fm xmitter, etc in the hard box, stick my tablet in next to it, there are elastic sections inside for my cords, outside pockets for larger items like my bluetooth can speaker, and a side pocket for a water bottle. It also has a nice carry strap. All for about $12.00. People are amazed at what I have in there. It is about 10” long x 8” high x 8” deep. I can even fit both of my kids 7” tablets in there also, but it is real tight then. Would you be kind of enough to please share the brand model name of the bag you have mentioned, or if you can share a picture. I am a fashion student and looking for new ideas to add to my design collection portfolio. A link will also help.